Kids across Berkeley are responding to Jason Reynolds' new book Ghost, talking about how it feels so real to them that they imagine themselves being right there with Ghost. This is definitely one of their favorite books, as we head into our Mock Newbery discussions--one that will stay with readers for a long time. Castle Crenshaw, who calls himself Ghost, is a kid my students can relate to. Some students know what it's like to have so much "scream inside" that they can't control it; others relate to working and struggling to join a team, but then having a bad decision almost cost you everything. Jason Reynolds brings readers right into the story with his conversational tone. You can imagine being right inside of Ghost, in his head as he's watching a track team practice, eating sunflower seeds, thinking about how he could run faster than any of those kids on the track. Reynolds hooks readers just a few pages into the book when Ghost shares when he discovered he could run so fast -- the night his father shot at him in a drunken rage, as Ghost and his mother ran for their lives. 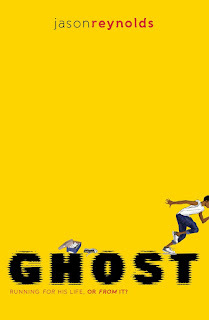 Some students noted how Ghost is a complicated character--and they were very engaged by his struggles to figure out how to fix the problems he created. Many noted how much they liked seeing Ghost change and grow during the story. They definitely responded to the pacing, talking about how they couldn't put this book down--staying up all night to finish it. And the ending, oh my. I have been particularly impressed by how 4th and 5th graders responded to the difficult topics of domestic violence and poverty. Reynolds helps kids think about these issues, and he creates space for acknowledging what it takes to keep going through these difficulties. He crafts a story that is full of hope and warmth, humor and relationships, even though it is also a story of struggles and bad decisions. Let’s think about Castle. What he wants more than anything else is an identity that is anything but a victim. He seems himself as a basketball player but won’t try playing. He is obsessed with world records because to him the record holders gain new identities by accomplishing crazy feats." Will this win the Newbery? It's definitely one of the best books I've read this year. But some may find the language too colloquial, and want to have more figurative language. It depends on how you balance the different elements, which you place more importance on. All I know is that I'll be sharing this with students for years to come. And it will be a book that stays with them in their hearts. That's what matters in the end. I want to send special thanks to the whole team in Berkeley who's been supporting our Mock Newbery project, especially our library director Becca Todd. The review copy came from my public library. If you make a purchase using the Amazon links on this site, a small portion goes to Great Kid Books. Thank you for your support.